Breel Embolo (r.) returned to action for Schalke on Saturday after nearly a year away from the first team due to injury. bundesliga.com caught up with the Switzerland striker to get his thoughts on the Royal Blue revolution, and how it feels to be playing once again. bundesliga.com: Breel Embolo, did you feel lost after fracturing your ankle so soon after arriving in a new country? Breel Embolo: No. Not at all. The support of the club and my teammates was there from the first moment. Of course I was shocked at first. You join a club with big expectations and you want to be successful with your new teammates, but everything can change in the blink of an eye. I immediately thought: ‘Damn, now you can’t help your teammates for a long time’. I picked up again pretty quickly, though. bundesliga.com: You completed a large part of your rehab in Switzerland. How was your contact with the team made during this time? Embolo: That's true. The club allowed me to complete the first four or five months of my rehab at home in Switzerland, near my family. I gladly accepted. There was always contact with the team, though, despite the distance. I felt a lot of support from Schalke from the very first moment. I had countless messages on my phone every day. This was good for me and showed me that decision to join Schalke was the right one. I already felt at home with the club after just a few weeks. bundesliga.com: Schalke is a very special club. What do you make of it so far? 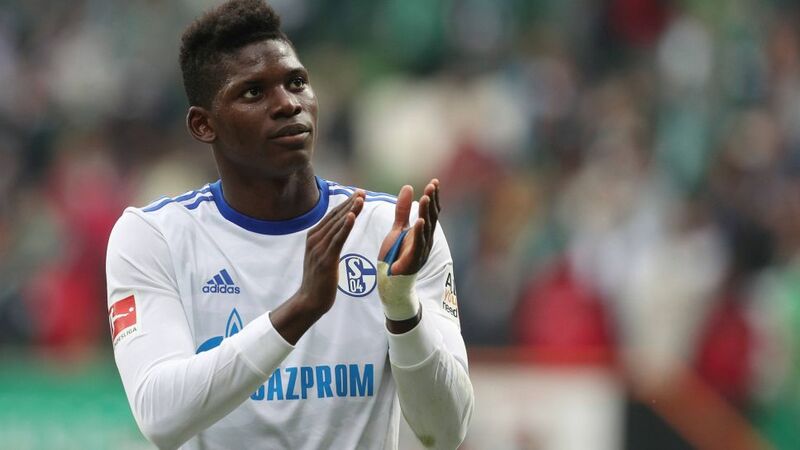 Embolo: Schalke is a big club, but it’s also family-orientated. You can feel that everyone loves and lives for this club. I’m very impressed with the experience. I’m still a very young player who’s moved from Switzerland to the Bundesliga and I’ve never seen enthusiasm like this. Everything is bigger and better at Schalke and in the Bundesliga. I’ve been amazed by it since my first weeks here, I’m on cloud nine. bundesliga.com: Did it make you feel insecure when Markus Weinzierl – a coach who badly wanted you to join the club – left in the summer? Embolo: No, I never thought about it at all. My only real concern was whether my ankle would work again as before. Fortunately, this is the case. Of course it's never nice when a coach needs to go. But it’s also a fact that we didn’t achieve the goals we set before the start of last season. bundesliga.com: Are you back to 100 per cent yet? Embolo: I feel very good, my ankle works perfectly and I think I’m at 100 per cent. I feel absolutely ready for the Bundesliga. bundesliga.com: What about the team as a whole? Is your teammate Thilo Kehrer right in saying that the team is still in the process of finding itself? Embolo: I have to agree with Thilo. When a new coach comes in it means a change for everyone. Every coach has his own ideas. The players need to absorb what’s expected of them and we’re still at the start of this process. This isn’t a problem, though. Our team has a good mix of youth and experience. We’re all hungry for success and we want to show the fans what we can do. We’ll only succeed if everyone puts the work in. Embolo: I can understand that some people would see it like that. However, I fell I’ve been well integrated already and now I want to finally justify the trust that was shown in me from the start. I want to repay them with my performances. bundesliga.com: You spoke to to Schalke club members at the recent annual general meeting in June. Were you nervous? Embolo: Yes, very much so! I'm not really the type to make speeches in front of so many people - I think there were nearly 10,000 (laughs)! But it was very important for me to take this opportunity. I wanted to introduce myself to the members and the fans, because last year it was impossible as I was with the Swiss national team at Euro 2016. Despite being nervous it was a wonderful feeling to be able to personally thank Schalke for the support they gave me from day one.